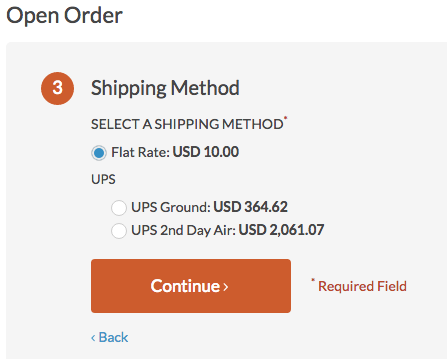 This topic describes how to add a custom shipping method for your OroCommerce-based store. Usually, a shipping method has several services to provide a flexible choice of price and delivery time. As an example, we will implement the “Fast Shipping” method — a simple method that requires just the minimum set of options to operate. It will have two services (types): “With present” and “Without present”. Thus, at the end of the topic, you will have the understanding of what steps are necessary to add a workable shipment method and the basic template that you can further extend when the need arises. The body of your class can be empty if you use regular case in the name of your organization (i.e. Acme or ACME in our example). getExtension() is necessary when you use uppercase, as Symfony treats uppercase letters in the organization prefix as separate words when creating aliases. # Set a priority higher than the priority of the ShippingBundle (i.e. 200) to ensure that all dependees from the ShippingBundle are loaded before the dependent methods of your bundle. To fully enable a bundle, you need to regenerate the application cache. However, to save time, you can do it after creation of the shipping integration. All the files and subdirectories mentioned in the following sections are to be added to the /src/ACME/Bundle/FastShippingBundle/ directory of your application (referred to as <bundle_root>). As you can see from the code above, the only necessary parameter defined for the FastShipping shipping method is the label parameter. This defines the name of the field that contains the label. When you select the type of the integration on the user interface, you will see the integration name and the icon that you define in this step. Save the file to the <bundle_root>/Resources/public/img directory. To make sure that the icon is accessible for the web interface, check if it appears (as a copy or a symlink depending on the settings selected during the application installation) in the /public/bundles/acmefastshipping/img directory of your application. To start using a service container for your bundle, first create the bundle configuration file <bundle_root>/Resources/config/services.yml. An installer ensures that upon the application installation, the database will contain the entity that you defined within your bundle. * Add acme_fast_ship_transport_label foreign keys. If you are working in a production environment, you have to use the --env=prod parameter with the command. Open the user interface and check that the changes have applied and you can add an integration of the Fast Shipping type. Note that at this point you are not yet able to add this shipping method to a shipping rule. getIdentifier — Provides a unique identifier of the shipping method in the scope of the Oro application. getLabel — Returns the shipping method’s label that appears on the shipping rule edit page. It can also be a Symfony translated message. getIcon — Returns the icon that appears on the shipping rule edit page. isEnabled — Defines, whether the integration of the shipping method is enabled by default. isGrouped — Defines how shipping method’s types appear in the shipping method configuration on the user interface. If set to true, the types appear in the table where each line contains the Active check box that enables users to enable individual shipping method types for a particular shipping method configuration. getType — Returns the selected shipping method type based on the type identifier. getTypes — Returns a set of the shipping method types. getOptionsConfigurationFormType — Returns the user interface form with the configuration options. The form appears on the shipping rule edit page. If the method returns HiddenType::class, the form does not appear. This factory generates an individual configuration set for each instance of the integration of the Fast Shipping type. In our case, it also contains the method createTypes() that generates the services (types) of the fast shipping type and assigns them labels. Shipping method types define different specifics of the same shipping services. For example, for Flat Rate, the type defines whether to calculate shipping price per order or per item. The Fast Shipping will have two types: “With Present” and “Without Present”. // Provide additional price calculation logic here if required. getIdentifier — Returns a unique identifier of a shipping method type in the scope of the shipping method. getLabel — Returns the label of the shipping method type. The label appears on the shipping rule edit page in the management console and on the storefront. calculatePrice– Contains the main logic and returns the shipping price for the given $context. If you implement a more complicated shipping method, see OroBundleShippingBundleContextShippingContextInterface for attributes that can affect a shipping price (e.g. shipping address information or line items). In the shipping rules, this template is used to display the configured settings of the Fast Shipping integration. To show a notification when a user disables or removes the integration currently used in shipping rules, use the event listeners to catch the corresponding event and the event handlers. # Disable the default deactivate method for the Fast Shipping integration. # Disable the default delete method for the Fast Shipping integration. #    b. if yes, displays to a user the confirmation dialog with the notification message and the link to the list of the corresponding rules. # Filter the grid with the active shipping rules that use the Fast Shipping method and generate the link to it. # Check that the method is used in the shipping rules. # Show the confirmation dialog with the notification message. # If there are no shipping rules that use this method, deactivate without displaying to a user the confirmation dialog.